Creating a statement wall is a great way to draw the eye and give your room a focus without taking up any floor space. While it would be lovely to have rooms large enough to fit, never mind lose, a grand piano in, for most British families space is a major limitation. A feature wall made of rough limestone cladding or glossy granite tiles can be transformative, giving the whole space an atmosphere without changing another thing. Having worked with builders and interior designers across Surrey and beyond, we have plenty of experience in creating stone feature walls. Here are a few key questions to ask yourself as you go along. Where is the focus of this room? A feature wall will draw the eye, but should also be more-or-less where the eye falls naturally. As a general rule, this will be the opposite corner or side from the main doorway, or where your eyes comfortably linger when you walk into the room. However much you might like to shift the focus, it’s not always possible – you’ll have little hope, for example of drawing attention to a feature wall that’s behind the door as you walk in. Is it light or very dark? The type of stone you use and the finish will either add light or strip it out of a room. 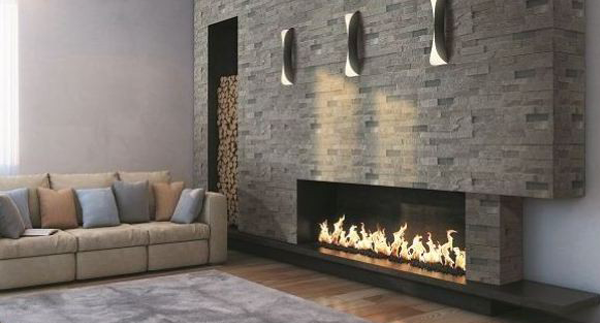 As an example, a light limestone with a rustic finish will tend to reflect warm tones into the rest of the room, while polished black granite tiles will absorb light and reflect back only icy notes. The two stones represent very different aesthetic styles, but they also work best in different settings – one would do better in a sunny room, the other in artificial light. When do you want to change the other décor? For some people, getting a house done up is the end of a hard slog, and they’re glad not to do it again for a decade. For others, furnishings are constantly shifting. Whichever camp you fall into, let your nature influence your feature wall. If you prefer to change your colour scheme and furnishings regularly, then choose a classic natural stone, such as slate-grey granite tiles, that will look great as your sofa shifts through the rainbow from magenta to teal to cream. If you just want to finish the project, on the other hand, a striking or brightly coloured stone, such as Silestone, is a great choice. What are your walls made of? Even thin granite tiles weigh a lot more than a coat of paint, so it’s important to check that your walls can handle stone cladding before you put it up. In most cases, if your walls are brick or concrete they’ll be fine without further support. However, interior walls may be partitions made of wooden struts and plaster board. While these do a great job of dividing rooms without taking up much space, they will usually need to be reinforced before they’ll be ready for stone. From the elegant luxury of a period drama to chic modern minimalism, stone bathrooms come in all shapes and sizes. While granite kitchen worktops and marble floors are common, many people don’t realise how many practical and beautiful options there are for including stone in your home. As granite worktops make their way into more London homes, people are asking: can stone really be clean? The answer is a solid YES! and as a result, this food safe material is being found in commercial spaces, such as restaurants and hotels, as well as family homes. Here’s how to keep your granite worktops clean enough to eat off.